I was born at Brighton General 1948. My family was living in Ewert Street at that time. We moved to 48 Walmer Crescent (a brand new house) Lower Bevendean when I was three in 1951. 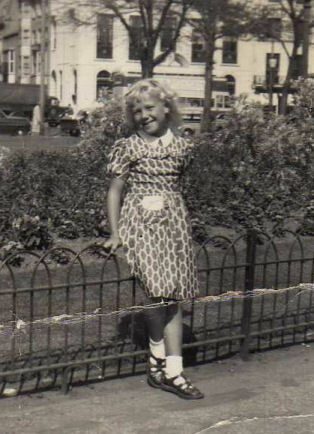 My dad was a nurse at Brighton General Hospital. I went to Lower Bevendean Infants School; I believe the headmistress at that time was Miss Cross. As I stood in the playground I could look down into the farm. I have a memory of seeing a lady feeding the chickens. 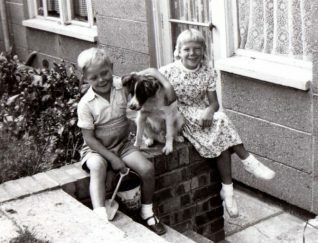 My childhood was carefree at Lower Bevendean; we happily roamed the fields with our dog Bimbo. We eventually moved from Lower Bevendean as my mother found it too isolated, to Clayton Road. 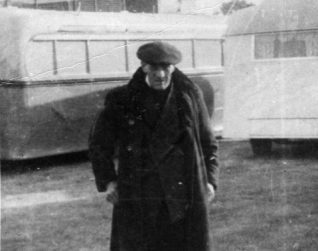 At the age five or six, I had some kind of breakdown as my granddad, Big Bill Taylor, a fisherman had died. I have wonderful memories of him. I remember him cutting the clothes line down at his home in Holland Street, for my sisters and me to use the rope to skip. I also remember he had a tin box, I think it was an old Elastoplast tin, full of Dolly Mixture sweets that he would share amongst us. Another memory I have is of going to Milner flats to an aunt, and collecting a very large flower arrangement of a boat, as he had been a fisherman, for granddad’s funeral. I also remember going with my mum to see my granddad when he was laid out in the funeral parlour in Lewes Road. That memory is very vivid; I think my mum took me along because she didn’t think I was aware of what had happened, but clearly I was. After leaving Lower Bevendean Infants School I attended Fairlight School Juniors and then to Fairlight Senior Girls, before it merged with Elm Grove School in the sixties. In 1966 I contracted glandular fever, and spent some in the Foredown Isolation Hospital. When I left school I worked at Western Road Woolworth’s store, British Home Stores, and then finally settled at Paragons Photographic in West Street. In 1971 I married Michael Tonks from Leybourne Road and we had two children, Paul and Caroline. Sadly my husband died unexpectedly in January 2004. But I have had a full and happy life. I still have contact with friends from the old days, and we meet for lunch every so often. If you can remember me, or my family, please do leave a comment below. My grandad Frederick and his parents William and Lucy lived in Holland St. in 1901, I bet they knew your grandad, they lived at 35. My dad Frederick (Ted) also had an aunt and uncle that lived in Milner Flats. Small world isn’t it? Hello, You may remember my mum, (Jean Harman) or my auntie Linda Harman. Also my uncle George Hefferan lived in the Kingswood flats for many years but sadly passed away a few years ago. His wife was called Clara. I remember visiting them when I was a child. Jennifer Tonks nee Smith; possible daughter-in-law to Ted Tonks, Lower Bevendean. I was apprenticed to WH Fellinghams working with Ted who taught me all he knew as an electrician. His war-time yarns, RAF in India, helping short male dogs with bricks and language of love were an education. I am indebted to Ted, the mentor I badly needed as a teenager. Rest in peace Ted. Daphne has not forgotten you. Hello Raymond “Daphne” Thatcher. Sorry for late reply. I am indeed Ted’s daughter in law, I married his son Michael. Sadly Michael died in 2004. I knew Ted before I knew his son. I got off the same bus as him at the Steine and walked up to work with him. There was a man with him, possibly you? A very nice man who sadly passed before I married his son. Thank you for remembering him so fondly.